Richard Meier has been an architect for half a century, and yet, the Pritzker Prize winner has never bought an apartment of his own design. Until now. Mr. Meier, who is based in New York City, was one of the first to buy a condominium at the Surf Club Four Seasons, his latest project in Miami. Pamela Liebman, the chief executive of the New York City-based brokerage the Corcoran Group, which is marketing the project, also purchased a unit there. In fact, two-thirds of the buyers are New Yorkers, said Nadim Ashi, the managing partner at Fort Capital, the developer. Over the years, Miami has been referred to as the city’s sixth borough, and it would appear that in the exclusive world of luxury real estate, this has never been truer. A wave of New York City developers has washed onto the Florida shoreline in recent months, bringing with them New York buyers, and increasingly, New York City-type pricing. Ove the past 18 months, prices have risen by 11.5 percent along the beachfront in Miami, with new condominiums averaging $1,011 a square foot, up from $907 a square foot, according to a December market report by the Miami brokerage firm ISG. At the same time, the number of units for sale has dropped by nearly 64 percent, to 623 units from 1,717 units, over the same period. There are also a number of high-priced penthouses for sale, including several that surpass $3,000 a square foot. The priciest is a $60 million home for sale at Faena, the development where the Goldman Sachs chief executive Lloyd Blankfein and the Apollo Global Management co-founder Leon Black, both New Yorkers, have reportedly bought residences. 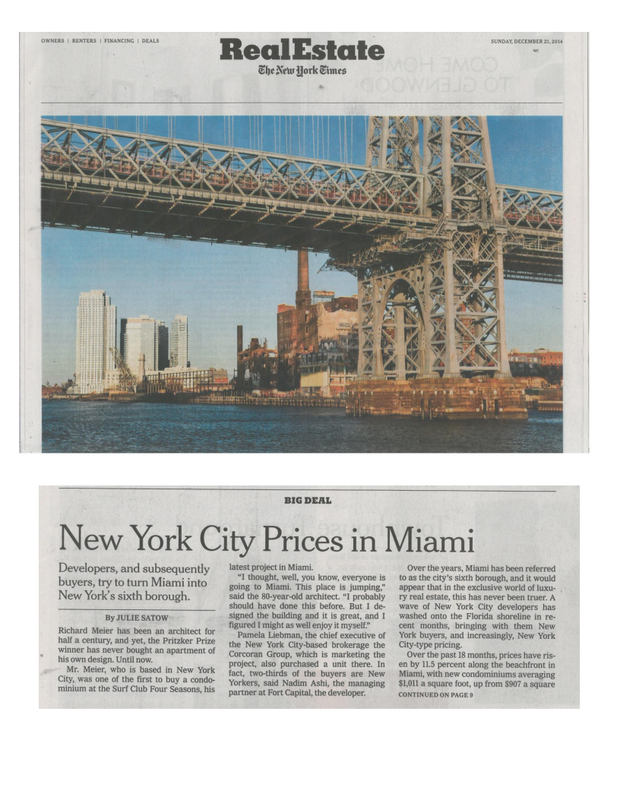 “For us, $3,000 to $4,000 a square foot is crazy, but it is considered a bargain in some better Manhattan neighborhoods,” said Daniel de la Vega, the president of One Sotheby’s International Realty in Miami. “New Yorkers typically went to Palm Beach for their vacation homes, but now they see Miami as a value so are coming here, driving up prices and creating a frenzy.” This year, Miami was ranked the seventh most important city to high-net-worth individuals with more than $30 million in assets; in 2009, the city was ranked 29th, according to the annual global Wealth Report, a study published by the real estate brokerage firm Knight Frank. “Miami is no longer the place where my grandma went to retire,” said the developer Richard LeFrak, whose family built LeFrak City in Queens. He owns two development sites in Miami, and is building 1 Hotel & Homes South Beach, a new condominium, with Starwood Capital Group. The project launched sales of its 29 penthouses during the recent Art Basel Miami Beach Fair, and New Yorkers bought three of the four penthouses that were sold. “New Yorkers love the convenience — it is just a two-and-a-half-hour flight — and of course, the warm weather,” he said. Evan Speiser, a 30-year-old vice president at the Speiser Organization, agreed. Mr. Speiser, whose firm is a family-run business that specializes in real estate development, acquisition and management, currently rents a loft on the Lower East Side. Rather than buy in New York, he decided to purchase a four-bedroom apartment at the Ritz-Carlton Residences, Miami Beach. Property Markets Group, a developer with JDS Development Group of the Walker Tower, which broke a record for downtown Manhattan when it sold a penthouse this year for more than $50 million, was also an early champion of Miami real estate. It has several projects underway, including Echo Brickell, also with JDS Development, and Muse Sunny Isles. The company has been aggressively pricing its Miami projects and is offering a free Tesla Model S to its penthouse buyers. Its latest listing is a 10,500-foot penthouse at Echo Brickell for $37 million. If sold at that price, it would be a record for the downtown Miami neighborhood, which is on Biscayne Bay and not on the ocean. Despite the price tag and its location, the penthouse already has a full-price offer from a South American buyer, although no contract has been signed. While prices are rising, some real estate professionals are growing concerned about a possible market correction. During the recent recession, Miami was one of the hardest-hit cities, with investors fleeing and prices plummeting. And while the market recovered relatively quickly, supply is once again surging. Since 2011, 304 new condo towers have been announced, according to the website CraneSpotters.com. In downtown Miami, 70 condo towers have been announced in a 60-block radius. Still, others say safeguards are in place this time that were lacking during the previous downturn. Developers now require buyers to put 50 percent to 60 percent deposits down on a unit, rather than 10 percent to 20 percent. “We incorporated this model from Latin America, where buyers are accustomed to putting up 100 percent of the purchase price before they close. So this will make it much harder for people to just walk away,” Mr. de la Vega said. “There is very little speculative building, in fact I would say there are no speculative buildings going up, because basically, with some exceptions, 40 to 60 percent of the units are sold with high deposits before any construction starts,” said Mr. LeFrak, who sold 100 of his project’s 156 units in the pre-construction phase. Still, he owns a development site in the Design District and another in North Miami, but has decided to wait to see how the market shakes out before building there. In the meantime, New Yorkers looking to flee a freezing winter and ever-rising prices might benefit.